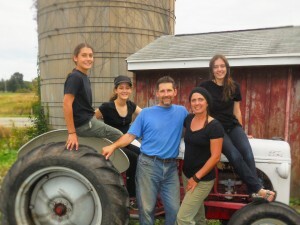 G ood Earth Farm is an organic vegetable farm on 22 acres in Oakfield, WI. We currently grow on 12 of the 22 acres. The other 10 acres encompass the homestead, an orchard, small fruit groves, wooded areas, and wetlands. A majority of our produce is sold through our Community Supported Agriculture (CSA) program. We do this for an important reason: direct connection with the people who purchase what we grow. Our CSA members have opportunities to visit the farm, work on the farm, talk with us, and see what we do. We feel strongly that knowing where food comes from and knowing your farmer are essential to a successfully functioning food system. In 2018, the Good Earth Farm CSA program will feed approximately 250 families. That’s over 800 people eating fresh produce grown on 12 acres of land in their own community. The farm is operated by farmers Nicole and Joe Schauer, their children, and a small crew of awesome employees—the GEF farm family! Good Earth Farm grew out of the rural couple’s expanding vegetable garden and a friend’s offer to purchase extra produce in 2004. Since then, local food-lovers purchasing seasonal shares of weekly delivered farm produce have grown from 13 in 2006 to more than 250 in 2017. Once “City Folk,” the couple is now firmly rooted as farmers, along with the three children they have “grown” on their farm. Check out the long version here! Meet the Farmers personally here.